For twenty years, Bedford House, at the corner of Quaker St and Wheler St, sat empty and rotting. Rain came through holes in the roof and thieves broke in to steal the fixtures from this handsome Grade II listed building, constructed over a century ago with the noble intention to be of service to the people of Spitalfields. Now a group of brave young people have come along who want to care for the building, they have worked hard to clean it up, repairing the holes in the roof and are opening it for events to serve the local community. Crucially, many are homeless, either students without any financial support or those who earn such low wages they cannot afford the exorbitant rents charged today in the East End. As responsible and educated individuals who find themselves struggling in the current economic crisis, they are appealing to the owner – who has let it sit empty all these years – to permit them to stay as caretakers, bringing life and social purpose to this neglected edifice until the time for redevelopment arrives. 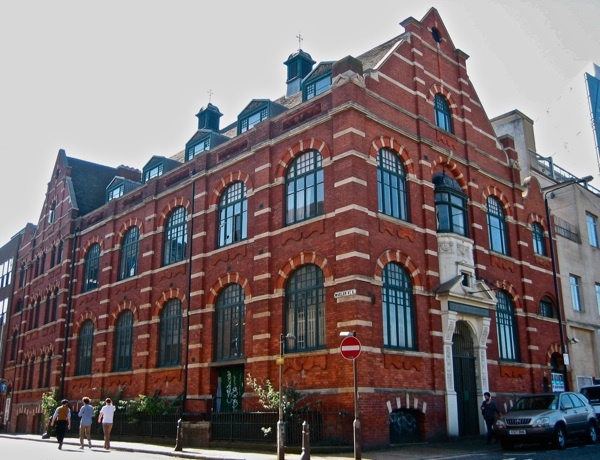 Built on the site of a Quaker meeting house of 1656 from which Quaker St takes its name, Bedford House is a handsome red brick gabled building constructed to a florid English Renaissance design by Rutland Saunders in 1894 to house the Bedford Institute. It was named in honour of Peter Bedford, a Quaker philanthropist and silk weaver of Steward St, Spitalfields, who formed the Society for Lessening the Causes of Juvenile Delinquency. From this building all kinds of charitable work was undertaken to alleviate poverty among the local population and educational courses, lectures and religious meetings were held there. In 1947, the Bedford Institute moved out of Spitalfields as the ambition of their activities spread across the London and today their work continues under the name Quaker Social Action. Meanwhile, Bedford House was converted for industrial use as a warehouse and bottling plant for E.J.Rose & Co Ltd, wholesale suppliers of spirits and wine, until they moved out decades ago leaving this atmospheric building in limbo as the preserve of ghosts and shadows, interrupted only by occasional vandals and ravers. This Summer – perhaps as a response to the times we live in - some significant events occurred, suggesting a new purpose for Bedford House. Two months ago, a small group of around ten homeless people who call themselves Penge Security (after the last place they lived) came to inhabit the spartan residential quarters on the top floors. 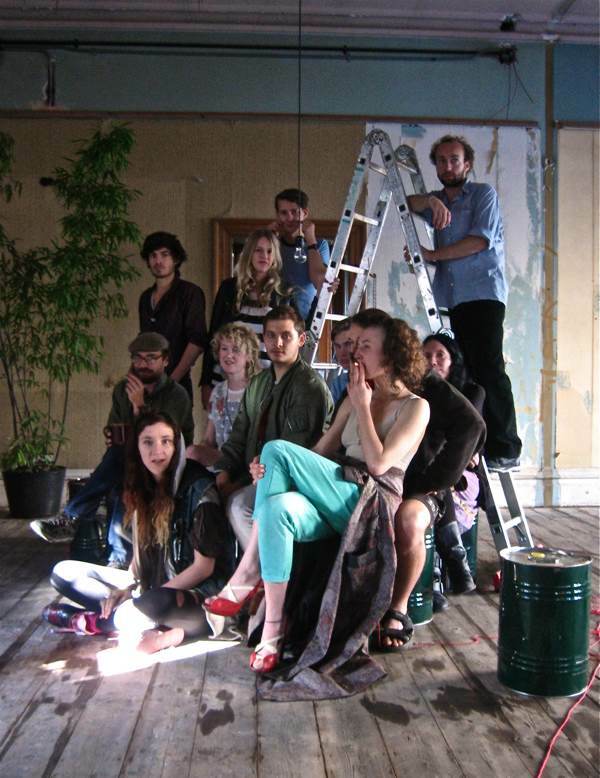 Then, three weeks ago, they were joined by a collective of artists from Berlin, calling themselves Masse und Macht, who have been organising small scale cultural events to welcome local people into the building. Yet with the owner – an individual reputed to be among the top ten in the rich list – unwilling to engage or even disclose their identity, and the possibility of a forceful eviction next week, the residents of Bedford House might have reason to feel discouraged, but instead I discovered them enthusiastically writing a proposal which might serve as the basis for an agreement to satisfy all parties. 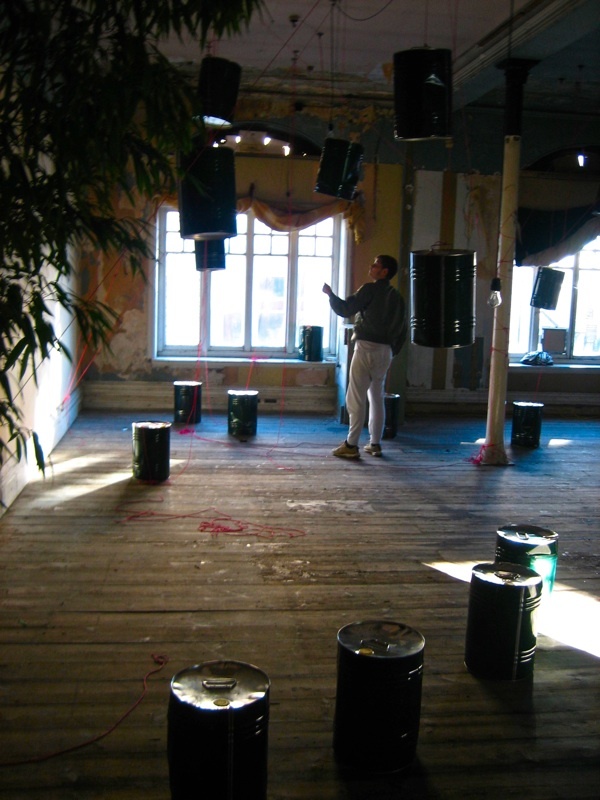 We all sat in the main hall of Bedford House, perched on large steel cans, in a room that had been six inches deep in debris two months earlier but now was clean and bright with plants and coloured sculptures. The night before a communal meal had been served with local people as guests and that evening an orchestra was due to give a free concert there. 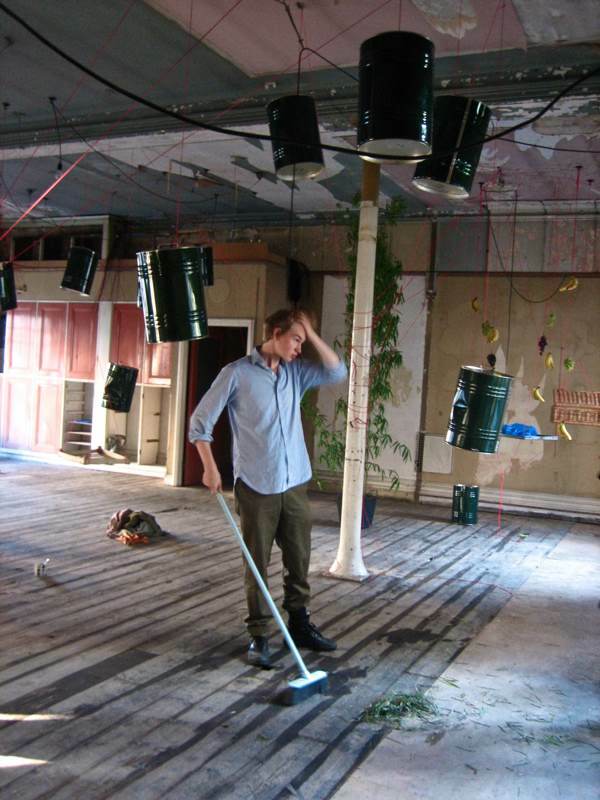 In another time, these educated, modest young people might have received student grants and rented accommodation they could afford, but in the face of the difficult circumstances they confront – which are not of their making – they have found the moral courage to work collectively and take the brave step of inhabiting an empty building with the barest of facilities. More than this, they are thinking beyond themselves to their responsibility to a wider society too. Well-informed, they told me there are as many as half a million homeless people in our country and as many as seven hundred thousand empty buildings – figures which speak for themselves. Let me admit, I have nothing but respect for those I met at Bedford House and it will be wrong if they should now find themselves criminalised for their actions, especially as one said to me, “It was a choice between this or the street.” If whoever owns this beautiful building can afford to let it sit empty for twenty years, they could enter into a custodianship agreement with the residents, who deserve the courtesy of being taken seriously. The irony of honest young people with no homes being thrown out of the building named in memory of Peter Bedford, founder of the Society for Lessening the Causes of Juvenile Delinquency is too great to contemplate. At the entrance, with E.J. Rose & Co Ltd’s sign. A mural discovered on an upper floor. 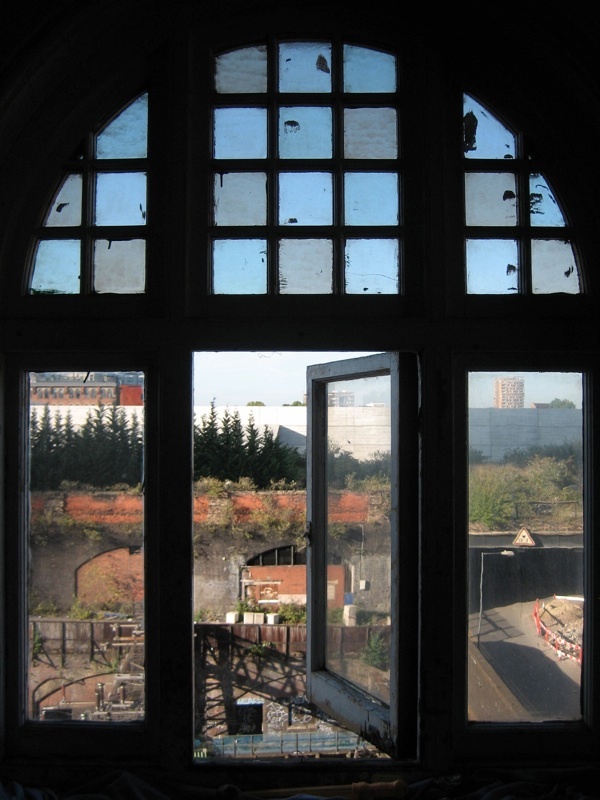 The view towards the Bishopsgate Goods Yard. You may also like to read about The Sit-in at Spital Square and The portraits of Spitalfields Nippers commissioned by the Bedford Institute. What a thought-provoking and inspiring post. A clear argument against the proposed criminalisation of squatting, which has a long and important history in this country. As the mother of two young sons struggling to pay very high rents in London, I completely sympathise with this group. It seems to me the height of immorality to allow buildings to sit empty for long periods of time when there is a housing crisis (as there has been throughout my life). Separately from that argument, what a tragedy to allow a fine building to fall into disrepair. Gentle author, thank you for your lovely blog, which has now become my regular start to the day along with the essential cup of coffee. How could anyone keep that wonderful house empty for decades? I hope that this group of people will be able to stay there. It’s an absolute scandal that this building has sat empty for so many years. Good luck to the people squatting it – I live in Quaker Street and fully support them. property taxes on it? The vast resources in London – including those of reporters – especially those of investigative reporters – must be able to find out the owner and appeal directly – or even publicly – to him/her/them. I admire the muster of these young people but am extremely saddened by their plight. London is a place for all generations, don’t price them out of the picture leaving the landscape only for the extremely rich – a situation we’d all like to be in I’m sure. Good luck – and find out who owns that gem they are polishing so beautifully. you may publish my e-mail addressif you wish. I’m not afraid of reactions to my comments. Thanks for posting them. Bravo and good luck to these people! i have been asking everyone lately where is the revolution? i think you may have found it. What a wonderful post. I lived as a student near Brick Lane seven years ago and am so thrilled that this impressive buiding is now home to such an impressive group of people – for how ever long it lasts, they are now part of it’s history. Time is running out to respond to the consultation that the tories are proposing to ban squatting. Its really simple, you can fill it out here . Good for them, I am so glad to see someone is making use of that amazing building. It’s interested to know about the history as I wondered what it had been in the past (it has been squatted before as I have been to two parties there about seven or eight years ago). Funny, what they fail to mention is the disturbance caused to local residents next door and across the road. There has been late night parties keeping people up till 6am. The use of band saws and hammers from 2:00 – 3:00am most recently on a Monday night!! I’ve seen people climbing over the roof tops which is extremely dangerous. We don’t know if it’s a squatter or a robber! The outside of the building now has ugly covers over the windows of rooms they are speeping in, or newspapers, graffitti etc which makes it look like we live in a third world country. The outside of the building actually looks worse now than before, no matter what they have done to the inside of the place. Don’t get me wrong, I’m all for the place being fixed up. This should be done Monday to Friday between 9am and 5pm. The building should not be occupied by tennans as it’s not safe and not Fit for purpose. I do wonder who is paying for the electricity bills? Tax payers? Also I do believe that there are plans for the building anyway. Whilst it is interesting to hear what is currently taking place within Bedford House as a resident of a nearby building I beg to differ with the story above – although I commend the ‘squatters’ for getting themselves portrayed in this light unfortunately the real story for people living on the street is quite different. Whilst the people currently living here may well have cleaned up the building they have also had large parties (and not the ‘cultural gatherings’ mentioned above) which have gone on until 6.30am and have meant local residents myself included have had to call the police and council noise complaint line numerous times. This is just one in a number of occurrences. Not cultural and not peaceful. This week at 2am someone within the building was using an electric saw or something similar and hammer on a metal door to the building meters from my bedroom window….until 4am. There are numerous comings and goings at all hours of the day and night and shortly after the building was first occupied and during yet another all night party all of the bikes within our building opposite were stolen. Residents pay large amounts of money to live on this road and previously enjoyed a peaceful and undisturbed home environment -right up until Bedford House became occupied. Now I cannot open the curtains of my flat, the building opposite has newspapers and blue plastic covering the (smashed) windows. 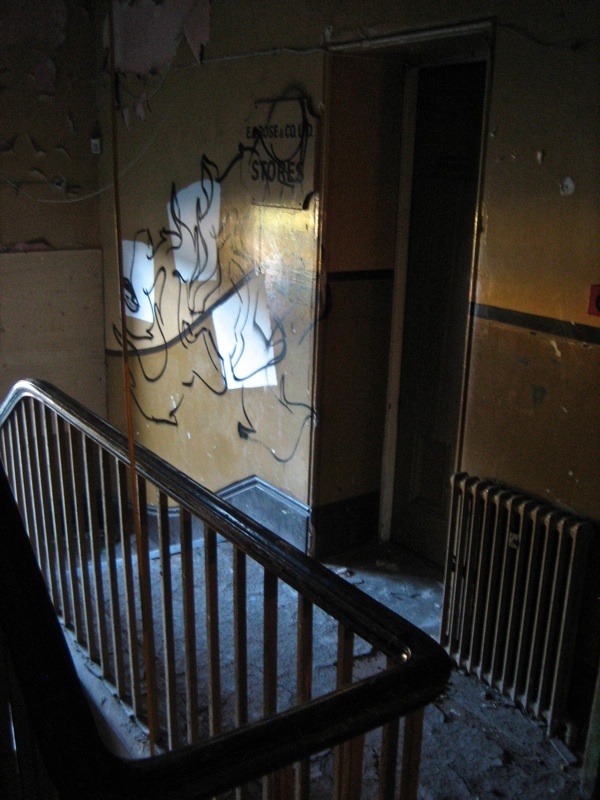 The windows have been covered in graffiti and the whole environment is a mess. I would also be interested as to who is paying for the water and electricity being used in the building? As well as the council tax. Or does this mean that our street is exempt and I no longer have to pay mine – please do let me know if this is the case….. I live in front of that building. I pay half of my salary for rent and bills and these guys are living there for free, they use electricity for free. They already had few parties and I couldn’t sleep in the night, so actually they are effecting my life in a negative way. What am I supposed to do? Supporting them? Any more events? I live nearby and I’d love to come and see what you’ve done! 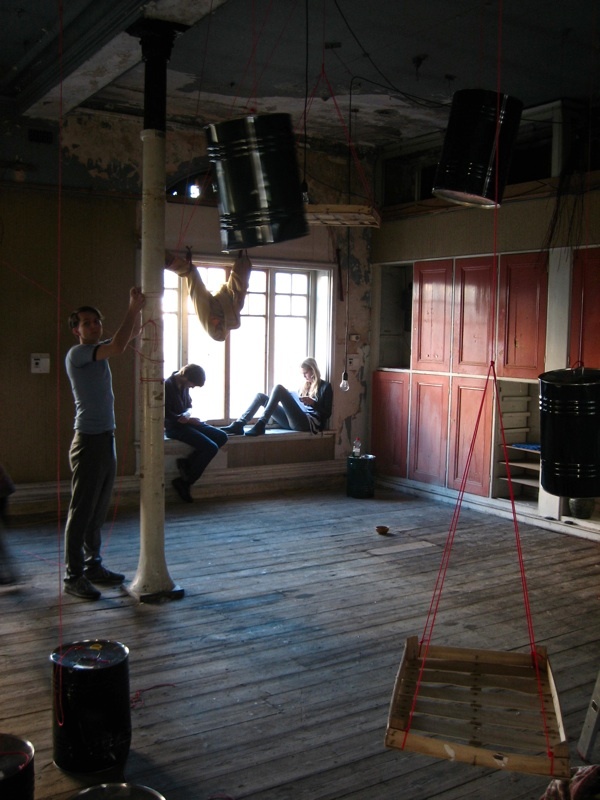 Interested in learning more about the Bedford House squat? Then please go to this page to read my full live-blog of the eviction of Shoreditch’s most astounding and exciting building. I’ve been at the scene since 7am interviewing squatters, police, and the entire neighbourhood, it seems. 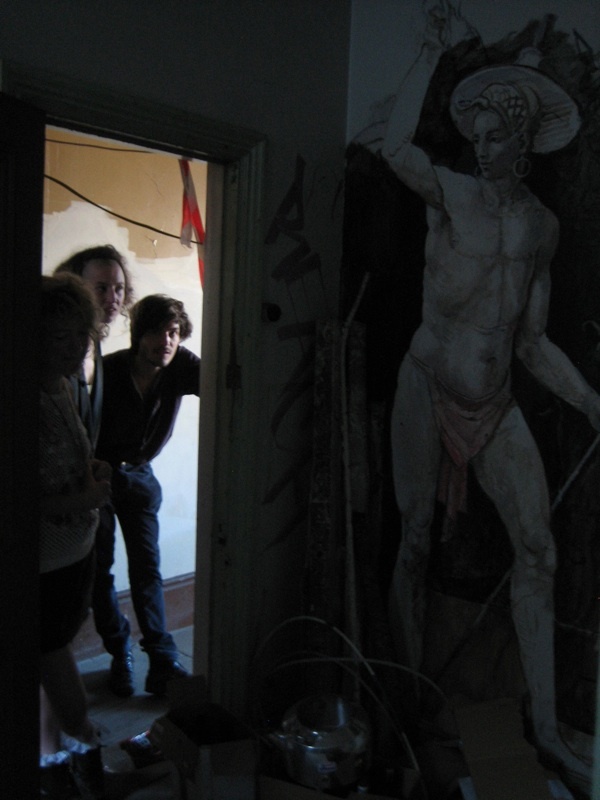 Keep checking the site for a full photo blog, and more info as we REVEAL THE SQUAT’S TRUE OWNER. I worked at EJ Rose wine company in Bedford House as a junior in 1978 until 1980 and have great memories from this time, looking at the pictures I can remember exactly how it used to look back in the 1970′s and even where I used to sit. it is such a shame that this building has been left to go to ruin. 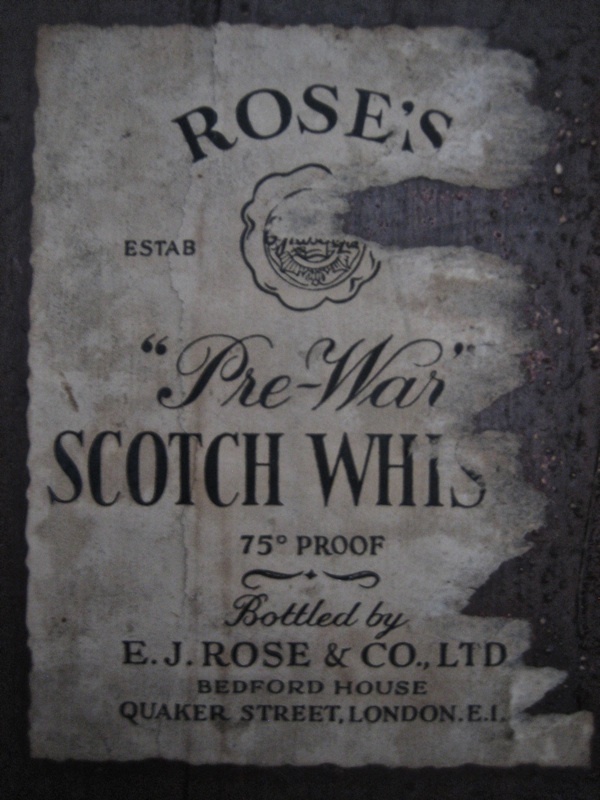 I looked at this site only because I have been sorting out some match box labels and came across one with E J Rose & co onit and decided to google it and see if it came up with anything, I glad I did as it was very interesting. The match box label gives no clue as to who E J Rose are or what they did. I think you are a brilliant group of people – this, surely, is what our society should be about – community, service, looking after and protecting history, tradition, one another. Good Luck with your work and plans – and let us hope that the owner sees the light…and it grows and grows with hope and passion, as it should. and suddenly your site has opened up the rest of the info and action…what has happened in and to this wonderful building and the people you had been talking about – I only walked passed it the other week, doing family tree research……..and thought it looked fab…..??? Being a Quaker, I had to walk down Quaker Street yesterday when I happened to be in Brick Lane looking for a bike shop. At the back of my mind, I half knew about the Bedford Institute and Bedford House, but had to research, because I was so shocked at the dilapidated state of such a beautiful building. How can this still be? Is there nothing that councils can do to persuade owners to put good (and protected) buildings to use? You can find out who owns the building by spending £3 on a land registry search. I don’t know who owns it but it’s now run by Oaksure , a property guardian company who did internal work to make it habitable . I believe around 30-40 property guardians now live there. A great use for an old building, providing affordable living space to young people in central London.